This morning’s equity market sell-off follows a 7% decline in China’s Shanghai Stock Exchange Composite Index. The decline tripped circuit breakers and led to a closure of China’s exchanges. A weak read on China’s official Purchasing Manager’s Index (PMI) and increased tension between Saudi Arabia and Iran are contributing to the negative tone. China’s PMI remained below 50 for a fifth month and points to continued weakness in China’s manufacturing sector. Protests and an attack on Saudi Arabia’s embassy in Tehran, precipitated by Saturday’s announcement of Saudi Arabia’s execution of 47 prisoners, including a well-known Shiite cleric, adds to investor concerns. The embassy attack led to the expulsion of Iranian diplomats from Saudi Arabia. Against this backdrop, we see that the U.S. economy continues to show slow but steady economic progress. 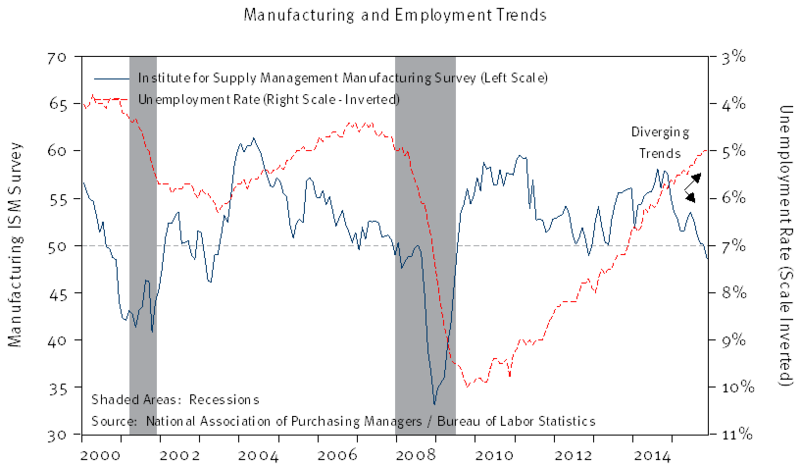 Data released this week will allow financial markets to gauge the strength of both the manufacturing sector (ISM Manufacturing Survey) as well as the labor market (December Employment Report) as we begin 2016. Now that the Federal Reserve (Fed) has raised the Fed Funds rate to 0.25% and has made it abundantly clear that any future rate increases would be “data dependent,” expect these two reports to garner more interest than previous prints. The chart below tracks the history of both the ISM Manufacturing Survey and the BLS Unemployment Rate from the beginning of the new millennium to the end of last year. Though the unemployment rate has come down from its high of 10.0% to 5.0% in December, the manufacturing sector (and the economy as a whole) ended 2015 with a whimper. The Fed should continue to monitor this report to help guide their future decision making. Strategic allocations are set to reflect our long-run forecasts for key asset classes. We invite you to read our latest annual report, Viewpoint 2016, by clicking here. The Shanghai Stock Exchange Composite Index (SSE Composite Index) is a stock market index of all stocks (A shares and B shares) that are traded at the Shanghai Stock Exchange. The index is calculated using a Paasche weighted composite price index formula, meaning the index calculation is based on a base period on a specific base day (the total market capitalization of all component stocks on that day). The base day is December 19, 1990, the Base Value is 100, and the formula is: Current index = Current total market cap of constituents X Base Value / Base Period.